Ooohhh, I like the sound of all those different textures and flavours. Hope your boiler gets fixed soon, it’s as getting to that time of year where it’s not nice to live without! The dill looks so inviting, Wendy! 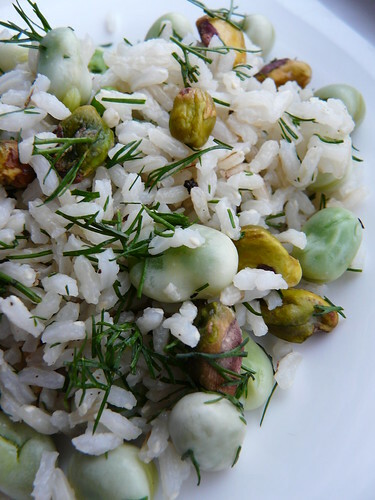 What it it about the combination of dill and broad beans? So beguiling. Thanks also for the link to Dispensing Happiness – the best thing one can dipense, I reckon. greens and rice – lovely – enjoy your walk! Sylvie – It’s fixed. Hooray! Johanna – Thank you! Did so! Looks amazing. Good luck with the boiler. Oh. My. Beautiful dish and photo.